Photo by Harland Schuster for KSF. 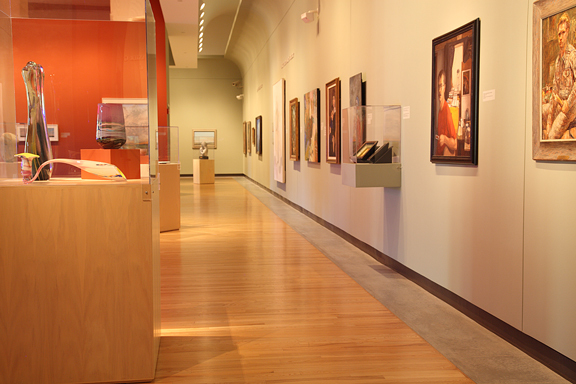 The Kansas Art Collection at the Marianna Kistler Beach Museum of Art is a finalist for the 8 Wonders of Kansas Art because it is the largest and most diverse such collection in Kansas. The mission of the Beach Museum is to collect and care for the art of Kansas and the region, and it has the most space devoted to the widest variety of Kansas art in the state. It is a destination for Kansans seeking to discover the state and its history through the eyes of scores of talented artists. Since its opening in 1996 the Marianna Kistler Beach Museum of Art on the campus of Kansas State University has become a vital part of the state's cultural life as a museum of Kansas and regional art. In 1996 the museum held fewer than 1,600 works, acquired since the late 1920s. It now boasts more than 7,000 paintings, sculptures, and works on paper from the nineteenth to the twenty-first centuries. A new wing in 2007 more than doubled the museum's Kansas and regional collection storage and exhibition areas. Five of the eight galleries showcase the museum's collection, while the other three galleries present a diverse roster of temporary exhibitions. Some of the Kansas art includes Blue Rapids painter Thomas W. Johnston, Lindsborg's Birger Sandzen, and Herington native Alan Shields's polyhedron painting, "Kansas Meatball." Examples of works on paper by such artists as Larry Schwarm (Emporia), Elizabeth "Grandma" Layton (Wellsville), and Mary Huntoon (Topeka) are regularly rotated in the Ruth Ann Wefald Gallery and the Donna Vanier Gallery in order to provide ongoing opportunities for visitors to see outstanding examples of Kansas and regional art. In addition, the collection has been assembled over the years completely with private donations. Although the collection is cared for by Kansas State University, no state funds have been used to purchase the art. Hours: Open Tuesday-Saturday 10 a.m.-5 p.m.; Sunday 12-5 p.m. In July 2010, the hours will change to Wednesday-Saturday 10 a.m.-5 p.m.; Sunday 12-5 p.m. Closed Mondays and holidays and expect different hours during academic breaks. Admission charge: No fee, donations welcomed. Free parking. Photos by Harland Schuster for KSF unless noted.